Here’s a dashboard to place at the front of your writing binder. I recommend laminating this sheet and using a marker to write on it. That way, you can move projects around as they progress, and reuse the page over and over again. 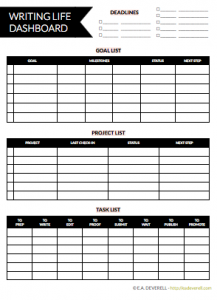 For more project planning help, be sure to take a look at the Productivity Pages.